I believe this is one of the first Christmas songs I ever learned on the piano that my piano teacher, Ms. Tucker assigned to me. 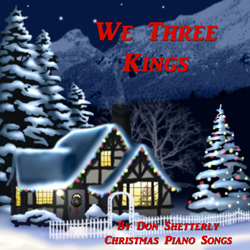 We Three Kings is a reverent Christmas song that is a salute to the newborn king. It has a different pace to it since it is in 3/8 timing. It feels like a song of hope. It feels to me like a song about the dawn of a new time and a royal beauty bright. Track #6 of 15 songs on Christmas Piano. The words and music were written in 1857 by John Hopkins. This is a carol that is associated with Twelfth Night that was celebrated in most countries as the day the three wise men were led to Bethlehem and found the manger. The song tells the story of what each of the three wise men brought to the baby Jesus. It is one of the most popular and well-known carols ever written. Reverend John Henry Hopkins, Jr. while teaching music at the seminary, wrote the hymn, We Three Kings, for a Christmas pageant. John Hopkins was an author, book illustrator, stained glass window designer, clergyman and editor of the New York Journal. John Hopkins was born in Pittsburgh, Pennsylvania in 1820, the oldest child. His father was from Dublin and was a successful iron master, school teacher, lawyer, priest and Episcopal Bishop. His mother was from Hamburg. John Hopkins reflected artistic talents of both of his parents in music, poetry and art. We three kings of orient are; bearing gifts we traverse afar. Prayer and praising all men raising, worship him, God most high. Sorrowing, sighing, bleeding, dying, sealed in the stone-cold tomb. Alleluia, Alleluia, Earth to the heavens replies. Chorus: O Star of wonder, star of night, Star with royal beauty bright, Westward leading, still proceeding, Guide us to thy perfect light.